Coastal Printmakers at the Art Complex Museum. 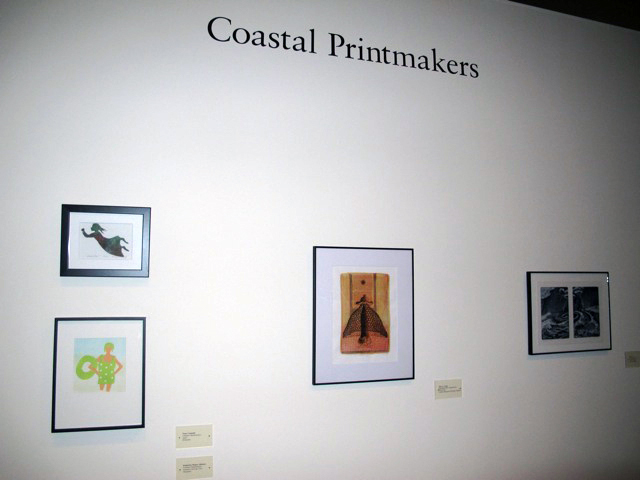 If you’re looking for artwork that’s unique and unconventional visit the new exhibit by Coastal Printmakers, a group of about 45 printmakers hailing from the South Shore of Massachusetts, that has opened at the Art Complex Museum in Duxbury, Ma. Although the group has organized 17 exhibits since it’s inception in 2008 this is the first juried show organized by the group. All of the work submitted was required to be smaller in size to fit comfortably in the atrium gallery as you enter the building. Black frames along with white mats give a continuity to the vast array of creative imagery all accomplished by one form or another in the printmaking medium. 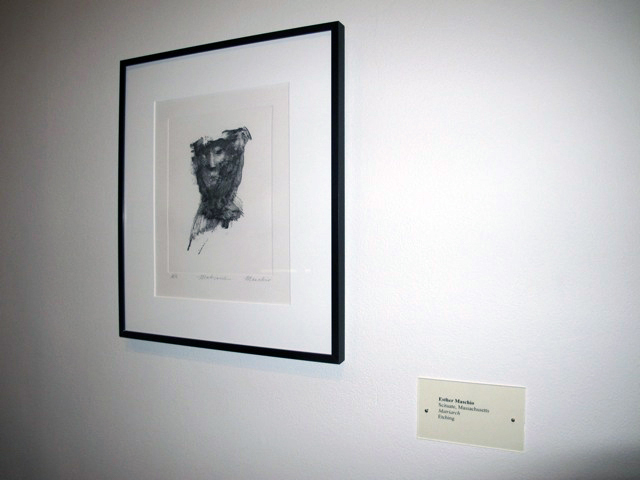 An etching entitled ‘Matriarch’ by Esther Maschio. Coastal Printmakers was initiated by the efforts of Elaine and Bob Cunniff, from Kingston, in 2008 as their passion for printmaking and a sense of artistic connection to other printmakers inspired them to form this community of like-minded artists. Many of the artists in the group have studied under the tutelage of Esther Maschio, from Scituate, who has been teaching printmaking at the South Shore Art Center in Cohasset, MA for several years. Esther’s support and encouragement has created a following of printmakers who are interested in creative exploration and personal expression through various printmaking techniques. 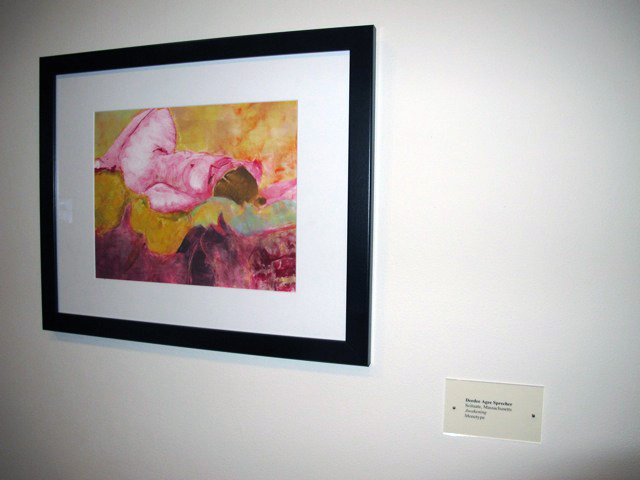 Monotype entitled ‘Awakening’ by Deedee Agee Sprecher. This figurative monotype by Deedee Agee Sprecher is both colorful and expressive and is a culmination of the many hours that Deedee puts into her work. 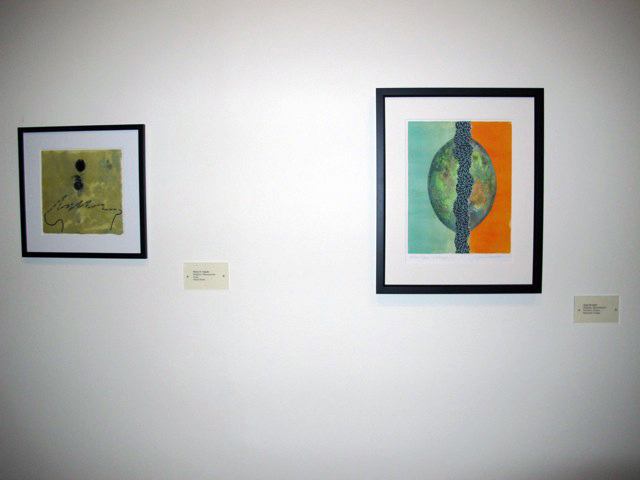 Mixed media prints by Marie Tegler and Joan Drescher. These two mixed media prints are a combination of monotypes with collage, oil inks, cardboard, collage paper, watercolor, glue and string. So simple-yet complex at the same time. ‘Untitled Vessel’ by Ann Conte. This large clay piece is monoprint on clay. 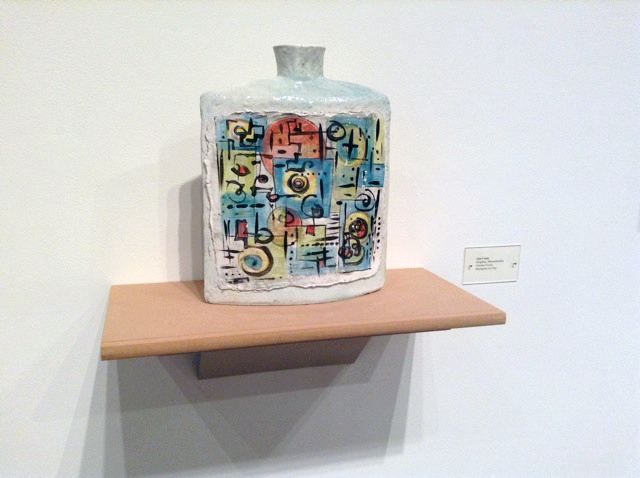 Ann Conte is always experimenting with both pottery and printmaking and this is a fine example that marries the two mediums. Lee Leonard’s houses are both abstract and realistic that evoke a sense of community in a village where we’d all like to live. 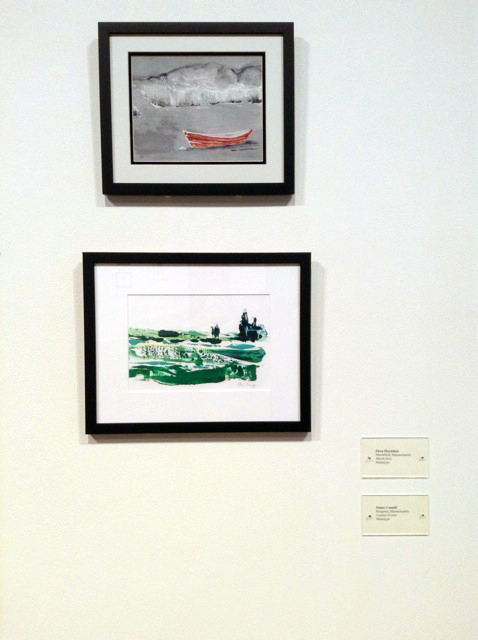 These two scenic monotypes depicting the shoreline of Massachusetts are by Flora Moynahan and Elaine Cunniff. An intimate viewing of these pieces reveals very expressive abstraction while accurately depicting the locations. Monotype collage entitled ‘8:30 Waterfall’ by Deanne Noiseux. This very fluid and dreamy monotype collage by Deanne Noiseux is inspired by her pilgrimage to China. 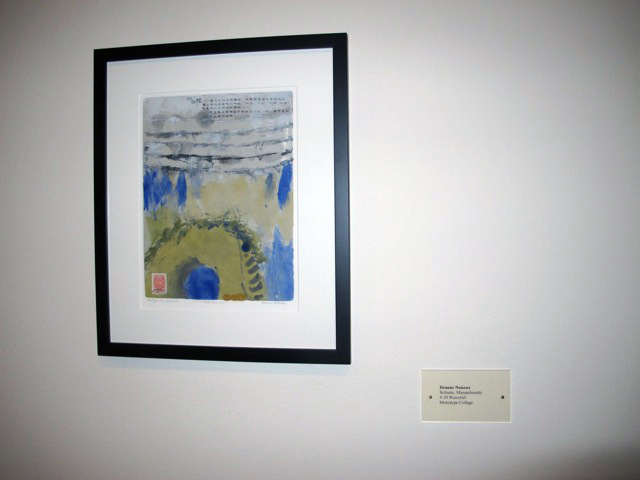 Many more of these intriguing and engaging prints are on display at this Coastal Printmakers Exhibit juried by Craig Bloodgood, the museum’s curator, at The Art Complex Museum, 189 Alden Street in Duxbury, MA now until November 10th, 2013. Hours for the museum are Wednesday through Sunday 1 to 4 pm. The Opening Reception for the exhibit is Sunday, September 22nd, from 1:30 to 3:30 pm. There’s also an artist’s talk on October 17th from 10:30-noon. The best way to view these original and unique prints is in person. 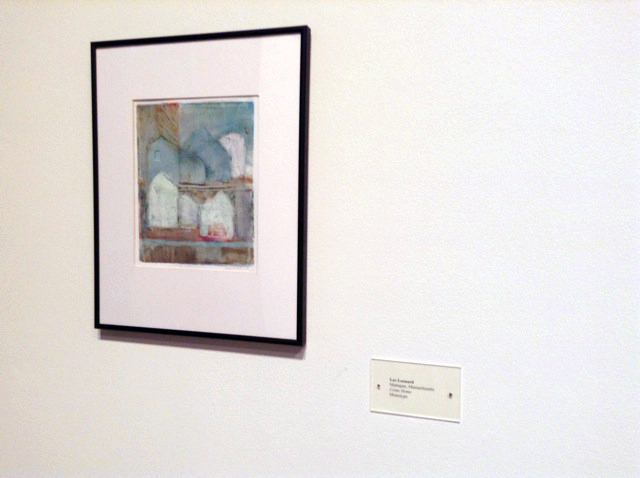 You are currently reading Coastal Printmakers at the Art Complex Museum at donna ingemanson studio.